It is no secret that California is the most gold rich state in the U.S. Ever since the first discovery of gold at Sutter’s Mill in 1848, there have been thousands upon thousands of gold seekers coming to California in search of riches. Of course it is the famous “Mother Lode” region of northern California that is best-known for gold. The extent of the gold occurrences in this part of the state makes it one of the largest goldfields on earth. While the world famous deposits in the Mother Lode garner the most attention, there are actually rich gold deposits that can be found all throughout the state. In fact, if you live in California, you are likely to be within just a few hours at most from good gold country. Below we will outline three primary areas where gold can be found throughout the states. There are some extremely rich gold deposits in the far northern part of California. The old-timers referred to this area as the “Northern Mines,” as they were located a good distance north of the Mother Lode. This region gets significantly less attention than many parts of California, yet there are still some exceptional prospecting opportunities to be found here. This region is located just south of the Oregon border; in fact it because of its similar geology it could really be considered a continuation of southwestern Oregon’s pocket gold county. The main drainages here are the Klamath River, as well as the headwaters of the Sacramento River. The region is primarily contained within Shasta, Siskiyou, and Trinity Counties. Good prospecting can be found around Redding, Yreka, and many of the smaller towns here. There are many remote areas here that still hold fantastic potential for gold. When gold prospectors refer to northern California, they are generally talking about the rich gold country of the Sierra Nevada Range. This is the famous region that thousands of ‘49ers flocked to in search of gold. And they found lots of it. Gold can be found just about anywhere in this part of the state. Major rivers here include the Feather River and American River, along with nearly all of the rivers and creeks that flow into the Lower Sacramento and Lower San Joaquin Rivers. The extent of gold occurrence in the Mother Lode region is unparalleled to anywhere in the United States. 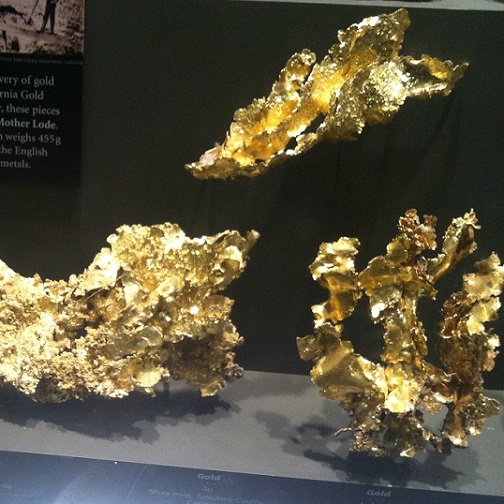 Some of the spectacular crystalline gold specimens on display at the Smithsonian Museum in Washington D.C. These come from the Sierra Nevada Mountains in Northern California. The geologic conditions produced an amazing amount of lode gold deposits, which even today still hold great potential for prospectors. And it is these lode occurrences that feed the countless placers in the creeks, rivers, and gulches throughout the Mother Lode. Although cost of production limits some of the gold mining in California today, it is really the political and environmental limitations that affect the gold output today. Much of the gold found today is by individual prospectors, but even small-scale methods like suction dredging are currently banned in the state. Some of California’s largest gold nuggets have been found using metal detectors. The southern half of the state seems to get very little attention from gold prospectors. Certainly it is not as rich as the gold country in the northern half, but there are still some fantastic gold prospecting opportunities here. The famous Mojave Nugget, (it weighed 156 troy ounces!) was found in southern California with a metal detector. Many other huge nuggets have been found here as well. One of the noteworthy areas in Southern California is the Dale mining district located near 29 Palms. It is a very productive area to find gold. Extreme temperatures limit prospecting in the summer, but in the winter many prospectors explore the hills in search of gold. With limited water, it is metal detectors and drywashers that are primarily used here. Another popular area is the San Gabriel River. Although it is far from being the richest area in California, it is an extremely popular area due to its close proximity to Los Angeles. The Kern River is another rich area that drains the very southern flank of the Sierra Nevada Mountains. This is a popular mining area for people located in the Bakersfield area. A spectacular amount of gold has been found in California over the years, and despite environmental restrictions that have been put in place over the recent years, there is still plenty of gold being found. Basic prospecting equipment like gold pans, sluice boxes, and highbanker can be used to recover placer deposits from creeks and rivers. And metal detectors can be used to locate gold nuggets from ancient river channels and bench deposits located high above the existing water line. The takeaway of this article should be that there are countless areas in California that you can still find gold, and not just in the Mother Lode. There are literally thousands of places from the top of California to the bottom where gold can still be found!